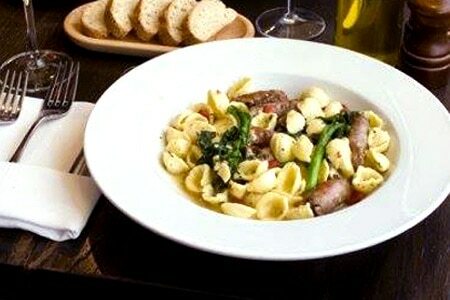 Il Villaggio Osteria specializes in Roman Trattoria fare, including wood-oven pizzas and housemade pastas. : Il Villaggio Osteria, located inside the Hotel Terra Jackson Hole, specializes in Roman Trattoria fare. Before dinner, guests can sample imported cheeses and sliced-to-order meats at the charcuterie bar. The dining room's menu offers wood-oven pizzas, housemade pastas and other traditional Italian dishes.